All mounting options are possible. The lamp is characterized by its high luminosity and good Recognizable at a distance. The design light can also be used as an indicator light , such as with engraved and colored fonts or symbols on clear acrylic glass , what the interior design benefits . The terminals are designed for through wiring up to 2.5 mm ². The lamp is available as a wall , ceiling , chain , pendant , rope , ceiling mounting and bracket mounting for single-sided or two- sided labeling. group / central battery systems as well as emergency lighting. 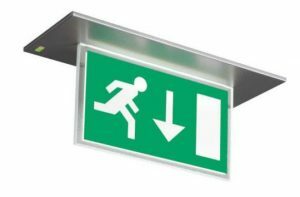 effort and cost by avoiding the need to manually carry out the Mandatory testing of emergency luminaires. .Probably the fastest emergency luminaire to mount. .Single model for Wall,Ceiling,Outrigger and Pendulum mounting. .Available in various mounting options. .Optional: Remotely controlled (infrared) At the touch of a button (no need for tools or a ladder). .TEST button and LEDs indicating both presence of power supply and signaling failures. .Available in 4 sizes (Viewing distance 20M,25M ,32M ,40M).